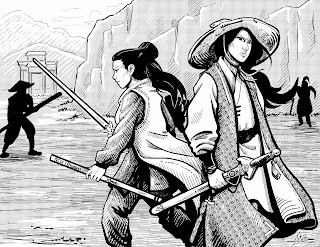 This campaign is set ten years after a previous set of adventures (HERE). This is the seventh full session of the current campaign (Session VI can be found HERE). At the Tomb of the Timeless Master the party split, with Min, Long Shu and Xue Lingsu heading back into the upper fortress of the complex to deal with the snake demon while Kang Xi, Zhi Zhu and Rong headed toward Zun City to take care of other business. This session focused on the exploits of Kang Xi, Zhi Zhu and Rong. As they made their way toward Zun City, Zhi Zhu noted symbols left for her from The Bear* indicating he wanted to meet north of the city in the tea fields. Rong and Kang Xi went into Zun City while Zhi Zhu followed the trail of symbols. As she got closer to the source, she noticed that the method of communication was out of date (they have been evolving their code language for many years). Deciding something was amiss, Zhi Zhu joined the others in the Imperial Inn in Hai'an Quarter of Zun City. Zun City was in the midst of the Phoenix Celebration, an event where they simultaneously burn several effigies of Phoenixes, execute prisoners, light off fireworks and perform a Phoenix Dance to mark the departure of the Phoenix Seasons (this is called the Five Departures). In the dining area the party spotted members of Mystic Sword and followed one of them when he left on his own. They trailed the Mystic Sword Disciple to the area in the tea fields where The Bear's symbols had pointed to. However The Bear was nowhere to be seen, instead they found Lady White Blade flanked by 17 of her Flying Phantoms. The party crawled up into the trees to spy, seeing that Lady White Blade held a tall basket in her hands. Fearing it was a trap they moved south and continued into Nature Loving Monk Territory. Once there Kang Xi learned Dog Bashing Stick Technique from Begging Dog. They stayed the night with the Nature Loving Monks, enjoying wine and food by the fire. The next day they headed to Rong Yao intent on reaching Purple Cavern Sect Headquarters. In the woods, Zhi Zhu continued to look for symbols from The Bear and eventually found an etching indicating he was in trouble and in the hands of Lady White Blade. They asked around Rong Yao to see if Mystic Sword had passed through, learning that Lady White Blade and several disciples had come to the city five or six days ago with two prisoners and headed north (presumably to Zun City). Fearing that her brother was in danger Zhi Zhu decided to go back to Zun. The rest of the group joined her and once there they learned that something strange had happened during the Five Departures. As the Phoenix boats burned, Lady White Blade swooped in and pulled a man from one of the ships. He was badly hurt by the flames and matched the description of The Bear. Lady White Blade healed him and declared that Purple Cavern Sect had placed him in the Phoenix boat to die, but she learned about it in time to save him. She then left with the Bear (who was barely conscious) and her disciples to the west (most likely to Mystic Sword Temple). The party followed her trail and along the way found the basket that Lady White Blade had been holding. It was fixed to a tree and a long sheet of paper was stamped to it bearing the words "A head for a head, a brother for a crown". This seemed to indicate that she wanted the Phoenix Crown in exchange for The Bear. Inside the basket they found the head of River Master Li (you can learn more about him HERE). They continued to Mystic Sword Temple, a large temple structure atop a steep hill. The party searched around the base for a point of entry and found a cave complex. Kang Xi remembered the text they saw on the wall in The Tomb of the Timeless Master "Between Mount Rong and Mount Hai'an" which would indicate the area that Mystic Sword Temple was in. He decided to look around the caves a bit to see if they could find anything related to the timeless master. Eventually they found a secret passage that led into an enormous domed chamber with a 60 foot statue and two passage ways trapped with an enormous blade. Down one of the passages Zhi Zhu found and took a golden scroll case that contained the second half of the Iron Spear of the Timeless Master Technique. They then spied on the temple and found a vantage where few guards could see. Observing for several hours they identified the building where Lady White Blade's chambers were likely to be and where The Bear was probably held. At night, when Lady White Blade conducted lessons with her students they snuck up the hill and Zhi Zhu climbed silently into the grand hall using her Crawling Tiger Technique. Inside she found the bear and also found the Wind Saber of Sunan (which she took). She slipped The Bear on her back and descended using her Arms of Silk. The party then moved down the hill but was spotted by a sentry who sounded the alarm. It took mystic sword a few moments to realize the extent of the breech and they gave quick pursuit. Luckily Rong's knowledge of the wilderness enabled them to cover their trail and make a good escape. By the second day of travel they seemed to have lost the Mystic Sword trackers completely and decided to go to Red Claw Pagoda so Kang could help his Sifu (Strange Phoenix) take over the gang. Kang asked Zhi Zhu if he could borrow the Wind Saber, saying her would give it back. Zhi Zhu agreed and Kang went to Bei (the town near Red Claw Pagoda) to contact Strange Phoenix and make his move. Zhi Zhu examined The Bear's condition and discovered that Lady White Blade had crippled him. He asked her to take him to Sun Mai Temple so he could become a monk. She agreed but it would have to wait until they settled the current situation. Kang concocted a paralytic poison and antidote, then sent a message to Strange Phoenix telling her to bring Red Claw to The Duck House. At the Duck House, Kang approached Red Claw and Strange Phoenix at a private table. Red Claw was pleased to see Kang and eager to hear about his many exploits. Kang sat down and poured them both some poison wine. He drank it, but gave himself the antidote. Red Claw consumed twice the amount Kang had and was soon paralyzed. At this point Kang decapitated him with the Wind Saber of Sunan and then threw down one of the masks they had taken from the Flying Phantoms of Mystic Sword. Strange Phoenix cried out that mystic Sword had assassinated Red Claw and Kang escaped in the clamor. Returning to the group Kang told them the deed was done. When Zhi Zhu asked him to return the Wind Saber of Sunan, he said "Zhi Zhu I am not going to give you the sword, it is too powerful and you know where the Phoenix Crown of Bao is." This led to a lengthy argument over whether he had gone back on his word and ended with Zhi Zhu using Arms of Silk to take the blade when she thought Kang was about to flee. She missed him with her initial attack however and Rong stepped in to mediate. In the ensuing conflict Rong struck Zhi Zhu with Storming Daggers. Eventually Zhi Zhu calmed and saw some sense in what Kang was saying. It was agreed that Kang would hold on to the blade but they would find some place to keep it safe from the world. Leaving The Bear in Bei they went to Zun to meet up with the rest of the party. *The Bear is the brother of Zhi Zhu and they meet from time to time to exchange news.